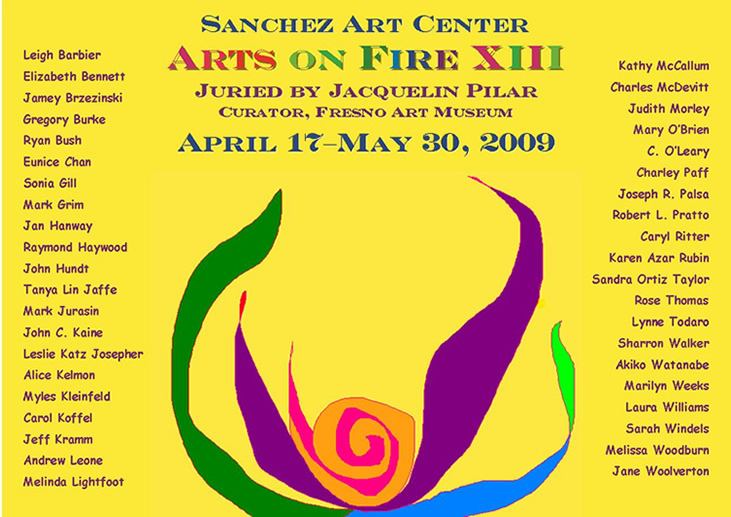 Passion for the arts and the excitement of this annual opening night will spark the celebration as Sanchez Art Center hosts its hottest event of the year, the thirteenth annual Arts on Fire Gala Opening Night, on Friday, April 17, from 6 to 9 p.m. This Pacifica tradition delivers an evening loaded with fun for the entire family. In addition to the fine visual art presented in the juried show, the entire facility will be aglow with fiery demonstrations, belly dancing, and music. The Gala Opening Night Spectacular will get a mighty kickoff by the Terra Nova High School Drumline and Jazz Band, under the baton of Michael Pens. Asia & Arabesque Belly Dance troupe will shake things up in the Sanchez Concert Hall, and lighting up the night in the Sanchez Courtyard will be Curtis Finger’s fire dance performance. Tonal Recall will provide live music in the West Gallery. An Art Boutique will offer custom-painted children’s sport helmets, custom skate decks, art books, and more. NEW! Note that this year the celebration will begin at 6 p.m. instead of 7 p.m. In addition, we will offer a Barbecue Dinner, your choice of Hamburgers and Veggie Burgers – $5; and Gourmet Desserts – $2 to $5. Sanchez Art Center invites the entire community to attend this free event, thanks to the generous support of Art Guild of Pacifica, Art4Moore Foundation, Bleyle Elevator, Inc., First National Bank of Northern California, Pacifica Performances, David and Lucile Packard Foundation, Shamrock Ranch, and Target. Children are welcome, and there will be reserved seating areas for seniors. Also, don’t miss the Plein Air Painters’ Exhibition in the Concert Hall. The backbone of Arts on Fire is the juried exhibition, which presents works by artists drawn from all over California. Past jurors have included noted art historian, author and founder of the Berkeley Art Museum, Peter Selz; Whitney Museum adjunct curator and California College of Art Dean Larry Rinder; and Curator of the Crocker Art Museum, Scott Shields. This year, juror Jacquelin Pilar (Curator, Fresno Art Museum) selected 57 of 189 artworks, representing 41 of the 72 entering artists. Jacquelin Pilar will give a Juror’s Talk on Saturday, April 18, at 11 a.m.
See the East Gallery page to preview the Arts on Fire XII Award Winners Exhibition.